In his latest book, Dr. Walter Doyle Staples invites his readers to experience life as fully aware, fully conscious, and fully functioning individuals. Staples presents powerful and life-changing ideas and concepts on how to transcend our ego-based state of consciousness to achieve deep peace, profound love, and infinite joy. 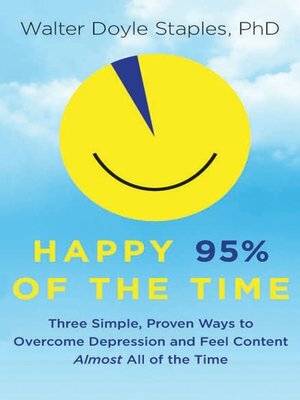 Happy 95% of the Time explains how our attachment to our egos can only create dysfunction and suffering in our lives, resulting in fear, anger, guilt, regret, depression, and/or despair. Staples contends we need to awaken to a new consciousness and experience a new beginning. Numerous world-renowned authorities on personal success—from Jack Canfield, Ken Blanchard, and Dr. Norman Vincent Peale to Art Linkletter, Anthony Robbins, and Brian Tracy—have praised Staples's previous books. We are sure they—and you—will find Happy 95% of the Time just as valuable and compelling.